1. Keep it Simple- The less non-essential stuff you have, the easier your life will be. Less to pack (and un-pack). And let's face it, the kids want to see the great outdoors. They don't really need you to lug toys from home which will likely be ignored once they see that beach, or river, or amazing campground you arrive at. They will play with sticks, and rocks, and bugs. And isn't that the point? 2. Meal Plan- Yes, I know, we all hate planning ahead as far as food goes. But having a general menu really does make your life easier. I plan a breakfast, lunch and dinner for as many days as we are traveling. I make sure to include a few very easy meals for long drive days. Then, I know exactly what foods to pack, and we don't (usually) forget sides or condiments when we plan this way. I mean, have you ever eaten pancakes without syrup? It's just sad. Really. Once on the trip, you can change around your meals as needed, but you know you will have the right amount of meals needed for your whole trip. Sometimes a meal that takes longer to prepare will be bumped if we have a really long hike or beach day planned. Then, we just re-arrange the schedule. Also, plan meals strategically for leftovers. For example, grilled chicken breasts are great for dinner one night, and leftover chicken is delicious on wraps for lunch the next day! 3. Adapt & Grow- It is unbelievable how quickly kids grow and change. This is pretty apparent while camping and traveling with kids. Remember to re-visit the kid "necessities" before each trip. If your kiddo has grown out of that hiking backpack you used to lug him around in, you don't want to take up valuable cargo space in your RV with it. Take it out and replace it with the scooter he's now riding. Same goes for highchairs and strollers. We are down to one carseat now...and it's GLORIOUS!! Also, know that times will change. The first time we hiked this Vernal Mist Trail, our youngest was a baby. He rode in a backpack on my husband's back. Our little girl was 2, and she walked almost the entire way. But it took a looooong time. And it was tough. But we tried to be patient, and we encouraged the kids and we all made it to Vernal Falls and back. This year (just a few years later), all of our kids hiked all the way to Nevada Falls and back. Everyone did such a fantastic job. Even the littlest scaled up those flights of stone-hewn stairs and along the tiny trail along cliffs (yes, I was freaked out myself), but WE DID IT!!! Just try to enjoy the things that you can explore with your kiddos now, and know that they will grow into more exciting adventures. Every moment shared in nature is special, and will be treasured. 4. 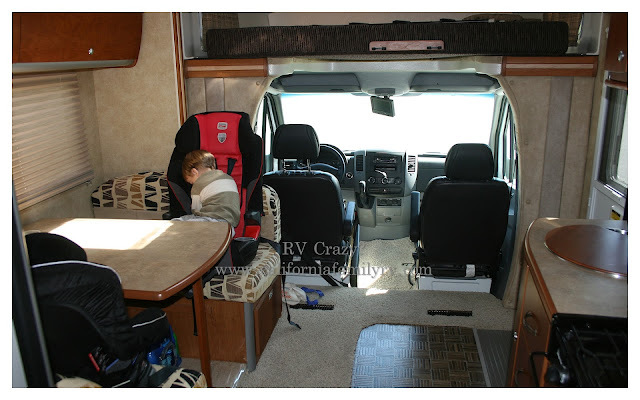 Include the kids- Encourage your kids to help with the work park of RV'ing too. Everyone can help, even the very littlest. Our kids help load, help pack their own clothes (please, for your own sanity, check them over. Unless you don't mind them forgetting pajamas or underwear. Yes, that really happened). When they were small, we'd give them simpler jobs, like making fire starters, or pulling out the level when we arrived at the campground. I'll be the first to admit that sometimes they were more work, less help, but it was important to us to include them. They grew up knowing that this is a family activity and we are a team. Everyone helps! Now our kids are 11, 8, and 6. They help fill the rv with water, help place chocks, help us spot hazards when we're backing into a camping space. They are awesome helpers! I truly believe that RV'ing together and working together has made our family a more cohesive unit that works SO well together. 5. Take stretch and potty breaks-Sometimes we grown-ups get so caught up in getting to our destination, we forget how little our travelers are. They do get tired of those long days on the road. Our family has a rule that every time we stop for gas, EVERYONE tries to go potty. And I encourage them all to get up and stretch, dance, and jump around a little whenever we stop. I actually join in on the stretching and dancing. It's fun. If I were to ask them if they need to go potty, they would probably say "no." Then 10 minutes on the road they'd tell me they need to go...RIGHT NOW!! So, we just have them "try" whenever we stop. Of course, as your kiddos get older, this won't be an issue. 6. Have fun!-Remember, this trip is supposed to be fun. Try to let the little things go, and focus on the beauty of nature around you. This is not always easy. Sometimes a kiddo is really hangry. Or has to go potty in the most inconvenient of places. Yes, most of our family's meltdowns boil down to these two issues. Try to laugh it off, and just go with it. Years later, you will remember it, and laugh about it. Even the misbehaving kid will look back and laugh with you. I promise you, there will be so many moments of spectacular sunsets, watching your oldest help your youngest rock-climb, smiling at your girls holding hands in the rain, seeing your little guy throw rocks into a roaring river, and hiking to a waterfall as a family....these are the moments. These moments are the majority of your RV'ing adventures together. And they will be so worth it. Hi J. Those vests were a gift from my sweet Mom in Law, and they have proven to be a FAVORITE for all of us. They have little pockets for keeping treasures (pocket knives, pennies, found goodies) and a huge zipper pocket on back which acts as a backpack. They kids love to put their water bottles back there. The zippers even are whistles in case anyone gets lost! We love them. I believe she ordered them from Lands End. She had them specially embroidered with RKL because that is the Adventuring club my kids formed. They raise money by writing and performing plays, and are working on a movie now. They use the money to rescue animals.